Alprazolam (Xanax) – What are the Facts? Over the past year, there has been increasing media coverage about alprazolam (typically referred to by the brand name Xanax), highlighting what is being seen as a rise in the number of young people using it. Most of the media reports have described individual cases or reports from treatment services, and there has been little discussion of the research evidence or the actual data. As with all media coverage which highlights potential changes in drug trends, there is a risk that the evidence isn’t clearly presented or even available, and that raising the profile of a particular drug can inadvertently increase interest from some drug users. Alprazolam is a medicine in the benzodiazepine family of drugs. Benzodiazepines are most commonly prescribed for the treatment of anxiety and insomnia, and they are also prescribed to control seizures caused by epilepsy. The most frequently prescribed benzodiazepine in the UK is diazepam, known by the tradename Valium. In comparison, alprazolam is a faster acting drug and is about 10 times stronger, meaning that it can rapidly cause feelings of sedation. Like other benzodiazepines, alprazolam can cause problems when taken without medical supervision. In the short term, its misuse can cause over-sedation, collapsing and overdose. Longer-term use can lead to physical dependence and severe withdrawal upon reducing or stopping use. Furthermore, taking any benzodiazepine with alcohol and/or other drugs increases the risk of harm. This is particularly the case when benzodiazepines are mixed with other sedative drugs. Alprazolam is not available from the NHS, but can be obtained on a private prescription in the UK. Illicit alprazolam, normally in the form of counterfeit Xanax tablets, can be bought from street level drug markets and is also available to purchase from illegal websites and social media apps. What is being said about alprazolam (Xanax)? There have been a growing number of personal stories reported in the media, often about young people who have developed problems with alprazolam (Xanax), as well as anecdotal reports that they are self-medicating for anxiety issues. There have also been discussions around alprazolam in political circles. In January this year, the MP Bambos Charalambous led the first debate in the House of Commons to discuss its misuse. Sometimes, the use of alprazolam (Xanax) is portrayed in the media as a major epidemic among young people. There is currently no evidence of this, but, as we explain further down, there is some evidence that prevalence is increasing. It is important to understand that patterns of drug use change over time. Some drugs rapidly emerge but then their use quickly declines, other drugs persist and cause significant and sustained harm. It is currently too early to know which category alprazolam will fall into. What do we know about alprazolam use? As the media coverage of alprazolam continues, PHE has been asked to comment, particularly on trends. There is some evidence to suggest that use is a growing problem, particularly among young people and young adults. However, the data we have does not give a clear picture of the prevalence of alprazolam use, as some of these data cover all benzodiazepines and not alprazolam specifically, making it more difficult to detect changes in use. Preliminary hospital admission data in England for 2017 indicates that there has been an increase in the number of people aged under 20 admitted to hospital with benzodiazepine poisoning. Over the same period, enquiries to the National Poisons Information Service about the treatment of alprazolam poisoning have increased substantially. PHE has examined UK police seizures data for drugs that were submitted for forensic analysis, which showed that the number of alprazolam seizures was far greater in 2017 than in previous years, increasing from fewer than ten seizures in 2016 to over 800 in 2017. Many of the Xanax tablets available on illicit markets are not of pharmaceutical grade, but are in fact counterfeit. This is a major concern because these counterfeit products may contain very variable amounts of alprazolam, making it hard for drug users to decide how much to take. Counterfeit Xanax has also been shown to sometimes contain other drugs and/or potentially dangerous adulterants. Information we have received from TICTAC, a drug analysis laboratory, has confirmed that samples produced to look like real Xanax tablets actually contained other drugs such as etizolam, which is another benzodiazepine linked to a large number of deaths in Scotland. TICTAC also found that ‘fake’ tablets that did contain alprazolam varied greatly in strength, with some tablets having more than 10 times the normal dose of an authentic Xanax tablet. The unpredictability of dose can be very dangerous to drug users who will not be able to judge how much alprazolam (or other substituted drugs) the tablets contains until after they have consumed it and are experiencing harmful effects. What is being done and what should be done? At PHE, we’ve been looking at all national data and other intelligence to try to get a better understanding of alprazolam use in England. We are also talking to experts and others to build a clearer picture. Our locally based PHE Centre teams are working closely with local authorities, providing them with data, guidance and other bespoke support to help them assess local treatment need, and commission services to meet that need. This may include specific support for those misusing alprazolam depending on the size of the problem in their area. We are piloting Report Illicit Drug Reactions (RIDR), an online reporting system for harm caused by illicit drugs, particularly new psychoactive substances (NPS). This system also captures the harms caused by misused medications, such as alprazolam. When new drugs or patterns of use emerge, the particular health consequences associated with them may not always be fully understood at first. For example, the bladder problems caused by ketamine were not originally recognised until different treatment services began to join the dots and find the link between the two. RIDR seeks to speed up the identification of harms, so that health and treatment services can rapidly deliver the most appropriate interventions. PHE encourages frontline staff to use RIDR to report clinical harms they are seeing in their local areas. This helps build a better understanding of the emerging problems and their geographical distribution. PHE holds a quarterly clinical network meeting with experts on new drugs and emerging drug trends, which provides the opportunity to discuss data from RIDR, the latest NPS-related research, and other sources. After each meeting, we update the RIDR dashboard to log current issues and concerns. Alprazolam has featured on the dashboard since September 2017. What are we doing in Cornwall & Isles of Scilly? Our treatment services have responded to this emerging pattern of use by learning more, training their staff, producing information for young people, raising awareness of the problem locally, and offering advice, support and treatment to young people having problems. Drug Watch, an information network, put together a briefing on alprazolam for professionals and the public (see below) which we are disseminating. We seek to ensure that staff working in services in contact with vulnerable groups are well-informed; and support the development of appropriate responses. It is especially important that any local communications to professionals and young people are proportionate so that they raise awareness and knowledge without driving up interest and drug-seeking. 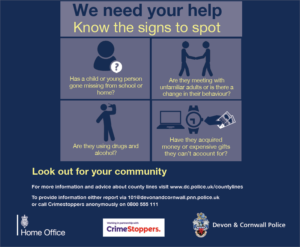 Police have today, Tuesday 3 July, launched a campaign to raise awareness of County Lines and how the public can help spot the signs of such criminal activity ongoing in their community. 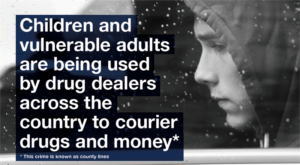 County Lines is a term used to describe urban gangs supplying drugs to other parts of the UK using dedicated mobile phone lines. The gangs are likely to exploit children or vulnerable adults to move and store drugs and they will often use coercion. 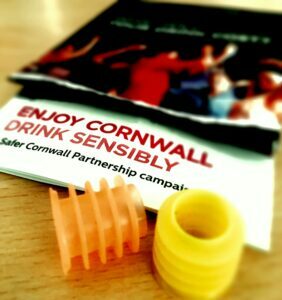 This is a national trend and there are criminal gangs using the County Lines operating model across Devon and Cornwall. “Neighbourhood teams and response officers are regularly patrolling areas that are used for ‘street dealing’ creating an environment where there is no safe place left to hide. “County Lines gangs will often target children and young people, women and vulnerable adults to deliver drugs and money between locations. “An operating base is also an essential feature of the County Lines criminal model. Gangs will regularly exploit vulnerable people, forcing them to build up a debt or using threats of violence in order to take over a person’s home, a practice known as ‘cuckooing’.